Abstract: The CML153XW we are looking at today from Hitachi Displays is a 15" TFT LCD intended for the value market and is quite inexpensive. We evaluate the quality of TFT displays with the help of a program called Nokia Monitor Test. The software application displays a range of colours and test patterns that can help diagnose just about any visual problems or defects a TFT display may contain. It can also be a very useful tool for properly adjusting a display to the optimal settings. The software consists of eleven tests which can be run in steps as adjustments are made to the OSD. As the tests are run we look for the following problems, only one of which should be inoperable (broken pixel). Broken Pixels: What we class as a 'broken pixel' can fall under any one of the following circumstances: Pixel always on (any colour), pixel always off, pixel unable to display a shade (red, green, blue, black, white), pixel shown colour gradient. Stand Stability: TFT displays are fragile components and the stand should offer adequately stable support as well as be easily adjustable. We deduct marks for quality control if there are any predominant broken pixels in a display. While many manufacturers may consider a few broken pixels acceptable, we believe the high cost of TFT displays should translate into a clear and unblemished image. Excellent, this is an LCD display after all. Very Good overall contrast and brightness - 1% to 9% black test patterns are separated well in intensity. However, 20% to 100% falters slightly in the range of 60% to 90% where the screen takes on a slightly rosy shade. 100% white is very good and quite bright. This test is more applicable to CRT displays than it is to LCD, so there were no problems with the CML153XW tackling it. The white test screen was very uniform and bright. The red test screen was bright as well but seemed a bit pale overall. The green and blue test screens were both very bright and vibrant. From a view of about a foot away from the screen, the covergence of the CML153XW was very good on the vertical test grids, and perfect on the horizontal test grids. The separation between colours is somewhat due to the size of the pixels, but overall it was quite acceptable. Only the purple test grid showed obvious signs of struggling as you can see from the blurry, but accurate close-up image below. Notice how the blue is visible to the left, and red to the right on the vertical line. Excellent, all patterns are clearly visible and defined in both the horizontal and vertical axis. Resolution was also excellent. The vertical 1 pixel lines can sometimes loose definition on even LCD displays but this was not the case. Excellent, all test patterns were displayed properly and with out any problems. The Hitachi CML153XW supports a broad range of resolutions. The full list of manufacture supported resolutions and frequencies are listed above. The monitor test program is often very useful at picking out points where the monitor may be less than perfect. These tests are very strenuous and are designed to stress the display in ways you might not normally see. TFT displays by nature typically pass all of the tests without any questions, but there are a few areas where differences begin to expose themselves. On this particular display we noticed a few shortcomings in relation to colour saturation and shading. Our impressions on the CML153XW are mixed ones at best. While we applaud the low cost of the unit and the very thin bezel we feel that there are a few too many short comings with the LCD panel itself to give much of a recommendation. 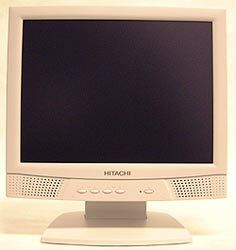 For home or office use you would be much better off with Hitachi's previous 15" LCD or spending a few hundred more to get another more capable display. The main limitation we saw was the rather shallow viewing angles that the display itself offered. Given that there are so many good displays that offer 80/80/80/80 viewing angles (on the highest end), why rest for anything less? When it comes down to it, you will quickly notice the limitations of a display that always has to be viewed from basically dead on so it is always best to go for something nearer to those parameters. The integrated speakers, while not enough to satisfy an audiophile, are what you might expect from something so small, so we have no complaints there - they sound good enough for MP3's at the office or internet radio. Of course one can easily forgo them completely and use the headphone jack and volume wheel. The LCD panel features a 0.297mm dot pitch which entirely acceptable for a display in this class and quite sufficient for viewing. With a brightness of 200nit, and a contrast ratio of 300:1 the display is on average with what other similar displays offer. However, as we mentioned before, the relatively shallow viewing angles - especially on the vertical axis are detrimental. Overall, it is great to see Hitachi providing consumers with a less expensive display that comes packing a lot of higher-end features, but had they invested in a slightly better LCD panel the package would be substantially more worth while. In the end it is the panel that makes or breaks an LCD display, and in this case, the CML153XW doesn't perform to the levels it really ought to.